Namibia's South West African People's Organisation (Swapo) is an exception among the liberation movements that became governments in Africa. As Namibia celebrates its 29th Independence Day on 21 March, it can look back on a period of increased consolidation of power. 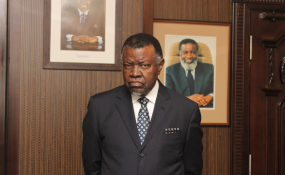 At the last elections in November 2014, it scored 80% of votes for the National Assembly, while its presidential candidate, Hage Geingob, garnered a record 86,7% of votes. Other liberation movements haven't fared as well in the role of governing parties. Zimbabwe's Zanu-PF is the most prominent case in point. For its part, South Africa's African National Congress had to part from its two-thirds majority in parliament in 2009; in 2016, it lost control over prominent metropolitan municipalities. It faces tough elections on 8 May. Swapo has not, so far, had to bother about such a loss of legitimacy. Namibia's system of a post-liberation democracy is a classic case of "competitive authoritarianism". The term was coined by the US political scientists Steven Levitsky and Lucan A Way. They argue that: ... parties whose origins lie in war, violent anti-colonial struggle, revolution, or counterinsurgency are more likely to survive economic crisis, leadership succession, and opposition challenges without suffering debilitating effects. They conclude: "Revolutionary or liberation struggles also tend to produce a generation of leaders... that possesses the necessary legitimacy to impose discipline during crises". Hence, new ruling parties that emerged from violent struggle, such as Swapo in Namibia... appear to be more durable. But the limits to liberation led some time ago to a re-examination of the liberation gospel, and its claimed social transitions. While Swapo continues to dominate, some cracks are starting to show. Geingob is expected to be the party candidate again for the next presidential elections in late 2019. He is 77 years old. Swapo's political office-bearers provide evidence of the party's gerontocratic structures. If the country's retirement age of 60 for public servants applied to politicians, its political bureau and central committee would have different compositions. Geingob digressed from his predecessors, Sam Nujoma and Hifikepunye Pohamba, by replacing the image of Swapo as the nation with a wider formula. In his first state of the nation address in April 2015, he introduced the powerful metaphor of the 'Namibian House', providing room for all. But the question about who should be accommodated - and how - remains unanswered. In 2016, Geingob proclaimed the Harambee Prosperity Plan. It was based on an anticipated annual economic growth rate of 7%. At the time, Angola's oil economy was already in shambles, and South Africa had begun on its rapid economic decline. One of Namibia's worst droughts was ravaging, and the government's overexpenditure had drained the state coffers. Then, a recession which hit in 2017 turned into a fully fledged depression. The state's total debt skyrocketed, which led to spiralling interest payments. As a local report put it: "Namibia has been sleepwalking its way into troublesome debt-to-GDP ratios that have increased from 7% of GDP in 1990/91 to 45% to GDP in 2018/19." The tabling of the 2019/20 annual budget was postponed twice, and is now scheduled for 29 March. Namibia has problems beyond its economy, too. In his closing comments to the second national land conference, Geingob said: "We need to ensure that we are living in a just and fair society, a society in which the mantra of 'No Namibian must feel left out' permeates every facet of our coexistence." But these are just words. The contrast to be found in Namibia's social realities is striking; for instance, it remains among the world's most unequal countries. According to a 2016 survey by the United Nations, 37% of the population was malnourished, and 24% of all children below the age of five were stunted. But only external factors were blamed for this miserable performance. After all, populists are never responsible for failures: others must be blamed, along with circumstances beyond leaders' control. Urban squatters living in informal settlements are estimated at almost a million people - 40% of Namibia's total population. In his new year's message for 2019, Geingob promised to end this humanitarian crisis by eradicating informal settlements. But he offered no explanation as to how this might be achieved. Activists from the Swapo Party Youth League have fallen out with the party leadership over urban land. Their formation of the Affirmative Repositioning movement in 2015 has turned into a relevant political factor. A frustrated new generation has entered grassroots politics. Other tensions have become visible too. A fallout between the deputy minister of land reform, Bernadus Swartbooi, and his minister Utoni Nujoma (a son of Namibia's first president Sam Nujoma), led to Swartbooi's dismissal first from office, and later from parliament and Swapo. Previously regional governor in the southern /Kharas region, he founded the Landless People's Movement in 2017. It has since registered as a political party that's due to be launched in May. At a Swapo central committee meeting at the end of August last year, Geingob denounced those mobilising around the issue of land as "failed politicians" who were merely looking for personal gains. He accused them of playing with people's emotions, and warned that they could instigate civil war. Such rhetoric doesn't sit comfortably with the image of a "Namibian House" in which everyone has a room to live in peace and stability. The results of the next parliamentary and presidential elections should confirm Swapo's dominance. But it remains to be seen to what extent the house's foundations are cracking. On Independence Day, not everyone who cheered the hoisting of the Namibian flag 29 years ago will be celebrating. * Henning Melber is extraordinary professor, department of political sciences, University of Pretoria. He is a member of Swapo since 1974.